14ymedio, Havana, 12 May 2018 — The activist Iliana Hernandez, director of the television program Lente Cubano (Cuban Lens), was released on Saturday after being arrested on Friday when she tried to enter El Círculo gallery, where a show that is a part of the independent #00 Biennial currently taking place in Havana is on display. Initially her whereabouts were unknown, but on Saturday afternoon Hernandez’s relatives managed to locate her at Cotorro police station, after hours of intense search and the unwillingness of the police to release her location. Hernandez was finally released at night and was able to return home, as confirmed by telephone to this newspaper. 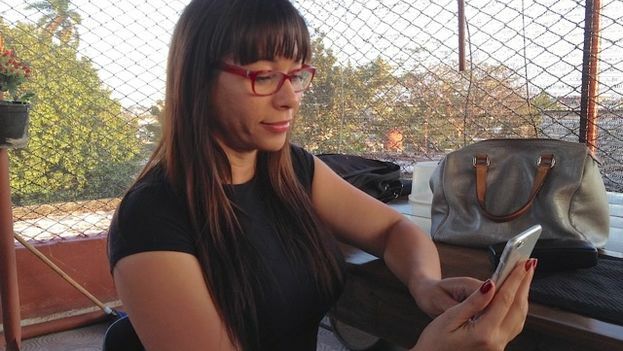 According to Lia Villares speaking to 14ymedio, State Security blocked several people from entering El Círculo gallery, including the artist Luis Manuel Otero Alcántara organizer of the independent Biennial, who was accompanied by a group of foreign participants. Last March, Iliana Hernández was declared a “person of priority police interest” after an interrogation at the Cojímar station, east of Havana. The police issued a “warning notice” to her and, in addition, she was prevented from traveling to Miami a few days later, as planned. Iliana Hernández was born in Guantanamo and has been linked to the sports world and activism. Nationalized as a Spanish citizen after living several years in that country, she returned to Cuba in 2016 and founded her audiovisual channel Lente Cubano. Since then she divides her time between Spain, the United States and the Island. “I do not plan to leave Cuba, I intend to fight to continue my normal life as I have until now between Spain and Cuba, which are my two homelands,” she said in a recent interview with this newspaper. In a similar vein, activist Liettys Rachel Reyes, a member of the Patriotic Union of Cuba, was prevented from leaving the country on Wednesday after being “regulated” by the authorities, according to her Facebook account. Reyes went to the José Martí International Airport in Havana to try to board a flight to the United States but an immigration official told her that she was under a ‘travel restriction.’ “This is how things work with a tyrannical regime like this. One that every day violates the rights and fundamental freedoms of people,” she complained.